Place the onion and garlic into a pan with the butter and oil and cook until transparent but not coloured. Add the liver and cook until brown – about 4 – 5 minutes. Add the fresh herbs and the port or sherry. Allow to bubble to burn off the alcohol. Allow to cool. Add the mascarpone and season to taste. Place in food processor and blend until smooth. Spoon into ramekins and smooth the top. Pour over the melted butter and decorate with sprigs of herbs and peppercorns. Refrigerate until ready to serve. Place the peaches onto a lined baking tray and drizzle with honey. Grill for about 5 minutes until starting to soften. 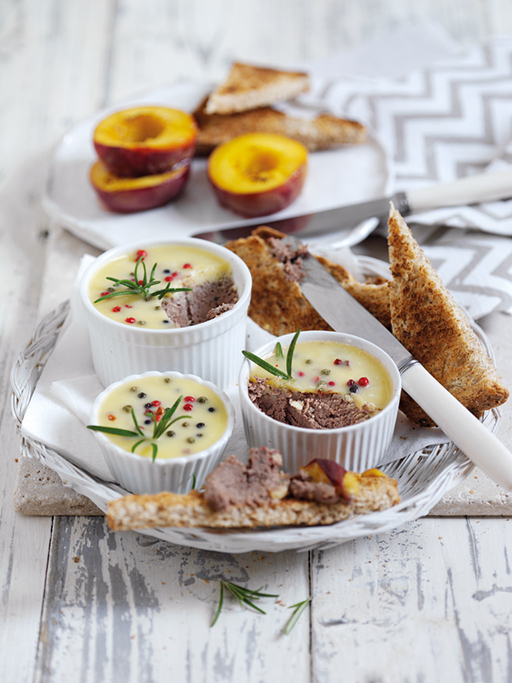 Serve the pate with a stack of granary toast and the grilled peaches drizzled with any of the honey juices.